For many people, the word mysticism conjures up occult, secretive rituals held after midnight in some dark cave. But true mysticism isn’t at all sinister or secretive, claims Growing into God: A Beginner’s Guide to Christian Mysticism author John Mabry, a a United Church of Christ minister. In fact, he teaches, mysticism is at the heart of an authentic Christian life. It is nothing more and nothing less than the pursuit – and enjoyment – of union with God, which is the goal of all Christian spirituality. 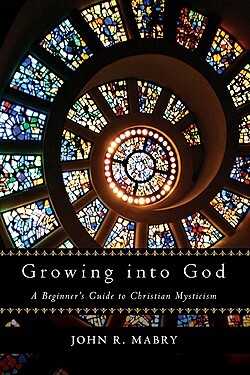 In Growing into God, Mabry “de-mystifies” mysticism, providing a friendly and accessible entry point to some of the teachings, practices and experiences of the Christian mystical tradition. Mabry’s great passion is to bring theology to everyday life by explaining complex ideas in everyday language that anyone can understand and find useful, and his matter-of-fact, pragmatic approach makes this beginner’s guide to Christian mysticism accessible and easy-to-follow. Mabry explores the classic mystical journey, which begins with the Awakening of a unitive consciousness that experiences everything as Divine and interconnected. The journey continues with Purgation, in which we empty ourselves of illusion; Illumination, in which we begin to see God in all things and all things in God; and, finally, Union, in which we marry our lives with God’s life, thereby bringing help, comfort and healing to the world. Along the way, and with an entertaining teacher’s clarity, Mabry recounts the stories of many Christian mystics in a simple way and aptly relates them to modern times. He also enriches each chapter with questions and answers to simplify points, as well as experiential practices to help readers embark upon the mystical journey themselves. In Growing into God, readers will learn the discipline of growing the soul into God—shedding illusory identities, deepening prayer, seeing God in all things and acting as Christ in the world. In this outline of practical mysticism, pastor and spiritual-guidance educator Mabry soft-pedals the palsywalsy-ness that often makes writers in his professions oleaginous for a more useful approach. He presents the mystical journey in the progression of stages and interregnums developed by Christian mystics from Origen to Evelyn Underhill: Awakening, Purgation, the Dark Night of the Senses, Illumination, the Dark Night of the Spirit, and Union. He discusses what great mystics have said, out of experience, about what the stages are like, humanizing each with pastoral humor, and including in the chapter on each a brief sketch of a figure whose mystical journey is famously associated with it, such as St. John of the Cross with the Dark Night of the Spirit (for Illumination, there are two, George Fox and Meister Eckhardt). Generous portfolios of questions and answers on each stage and night and of great mystics’ words on each, guidance on specific spiritual practices, and two appendixes on other conceptualizations of the mystic’s path fill out a superb common-language primer. In this dramatic and engaging book, which grew out of a course he taught at John F. Kennedy University in Pleasant Hill, California, Mabry begins with the idea that we all can be friends with God and that "mysticism is the pursuit of — or enjoyment of — union with God." The Catholic theologian Karl Rahner said: "In the coming age, we must all become mystics — or be nothing at all." In this beginner's guide to Christian mysticism, Mabry maps what this spiritual path looks like and profiles some of its movers and shakers. He provides added value to the book with sections on Questions & Answers, The Mystics in Their Own Words, Spiritual Practices, plus two appendixes on "The Mystic's Journey in Liturgy and Tradition" and "The Mystic's Journey and Spiritual Development Theory." Mabry (Grace North Church, Berkeley) addresses the broad questions that surround mysticism in the Christian tradition, too often thought of as something esoteric or secret. Mabry usefully reminds us that authentic mysticism is a core part of Christian practice that returns us to community rather than pulling us away. His book includes common questions about mysticism, quotations from renowned mystics, and thumbnail biographies of mystics cited. — Dr. Carol E. Parrish Harra, Dean Emeritus, Santa Sophia Seminary, Tahlequah, Ok.